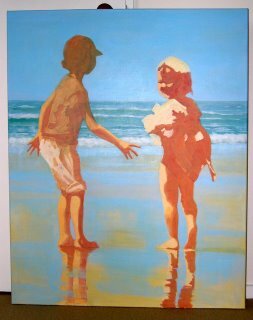 I am English and emigrated to New Zealand with my husband in 1999, since when I have been able to pursue a long held dream of expressing myself with paint. Ideas for my work come from a variety of sources, including images from the natural world, dreams, emotions and memories. These are portrayed through a mix of colour, texture and contrast that evolve during the act of painting. I enjoy drawing and pastel work, and paint with acrylic on canvas, often incorporating collage and textured elements. For me one of the many joys of painting is the continuous exploration and development of ideas, and my hope is that the resulting work will give pleasure and invite quiet contemplation. Painting With Acrylics Some Tips! Acrylic paints are not that easy to get used to … at least that’s what I found when I started with them. They dry very quickly so paint often gets wasted, they can ruin your brushes and the ‘covering power’ of different colours varies quite enormously. So I thought that I would post a few general tips for using acrylics …. things that I have read and tried out that worked, and other things that I have found out through trial and error! I use every sort of brush with my paints, both synthetic and non-synthetic. This is because I don’t have that many brushes that I really like. I have found that the main thing to worry about for your brushes is not to let paint, medium or varnish dry on them. Absolutely fatal … I recently totally wrecked my only 3″ brush by putting it down after varnishing and forgetting all about it. Sadly, repeated soaking and washing was to no avail. Always keep a jar of water to hand to place your brush in when you have finished with it, whether temporarily or completely. The bristles will stay undamaged until such time as you can wash the brush thoroughly in warm water and liquid detergent. I have tried several different styles of palette with varying degrees of success. The large plastic ones with lots of small paint-wells and 3 or 4 mixing areas are really only any good for very small paintings when working with acrylics. I think that these are best kept for oils or watercolours. Similarly the small round ones with deeper wells, although capable of holding a little more colour, are not suitable when you need to mix many shades or larger amounts of paint. White plastic picnic plates and bowls are great for mixing up larger amounts of acrylic paint. Kitchen cling wrap can be used to seal them between sessions to help keep them workable. When finished with I soak them in hot soapy water for a few minutes and all the dried-on paint films can then be washed off really easily. However, it is safest not to let these ‘leftovers’ drain into the ‘grey’ waste-water system for ecological reasons. I have a large white heavy duty plastic tray similar to those used to display meats in butchery departments. This also makes a great palette but of course the paint is at greater risk of drying up before you have finished your session. I get around this by putting a couple of thicknesses of kitchen paper-towel on the base and then wetting it thoroughly. Next I place a layer of baking paper (silicon coated or greaseproof) on top. The kitchen towel stays wet for quite a while (and you can re-wet as required) keeping the baking paper moist so the paint does not dry out. This ‘damp palette’ can also be sealed in a plastic bag overnight for use the next day. One of the frustrating things I have found when using acrylics is coverage … by this I mean the ability of the paint mix to cover over what is underneath. While I am often happy for the underlayer to show through there are equally as many times when I don’t want it to! Some manufacturers of acrylic paints give information on the tubes as to whether the pigment inside is Opaque, Semi-Opaque or Transparent which is very helpful. Where this information is not available one just has to find out what the pigment is going to do by trial and error. I have found it useful to build up a collection of Opaque and Transparent versions of the main primary colours that I like to use, e.g. Pyrole Crimson (Opaque), Alizarin Crimson (Transparent), Cobalt Blue (Opaque), Ultramarine (Transparent), etc. So that I can mix an opaque with a transparent to get a more opaque primary or secondary when I need one. To increase the opacity and covering ability of any pigment I often mix it with a small amount of White or Naples Yellow. And there are some lovely new neutral tones becoming available these days which can be mixed with other colours to make beautifully greyed tones, e.g. Toning Grey Yellowish manufactured by Atelier, and Unbleached Titanium by Matisse. Sometimes a passage does not turn out how you want it to but, when working on canvas or board, this can often be rectified as long as the area is tackled the same day. And sometimes these remedial efforts result in unplanned and pleasing effects! I always keep a clean wet cloth and a roll of paper towel to hand while painting so that I can ‘wipe out’ colours as soon as possible when I feel they are not right, and for lifting runs or splashes. Sometimes it requires a little bit more effort to remove the offending area and for this I scrub gently with a toothbrush and soapy water. But this can only be attempted before the paint has truly set (under 24 hours) and I only try these methods where I am satisfied with the underlying area and want it to remain in situ. Where an area or painting has completely gone to custard I just paint over the whole thing with gesso and start again! 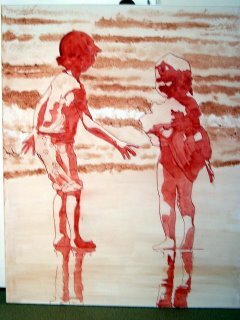 I began by drawing the subject in brown pastel pencil and then go over the outline drawing with red oxide acrylic [next time I will use less pigment for this as I subsequently found the outlines rather difficult to get rid of]I blocked in shadow shapes on the figures with red oxide and washed in some of the shadows/reflections in the sea and sand. 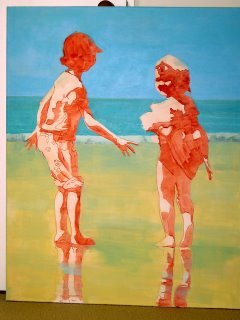 My aim was to establish the tonal values of the painting from the outset. I started filling in the background and foreground in fairly large blocks of colour …….. no details yet. At this stage I was experimenting with different mixes and hues. I wanted to get the feeling of a very hot, bright day.I decided early on that I would lower the horizon to increase the sense of distance. Because it is a large canvas I took frequent breaks and looked at the painting in the mirror from about 12 feet away. It would be all too easy to get involved in unnecessary detail …. I kept having to remind myself that I wanted this painting to ‘come together’ only when seen from a distance!Although it would be nice to get the background colours right before moving on to the figures I was not too worried as I knew I could easily change things later. I started working on the figures with very light washes.I realised that I was not very happy with the sky and sea at this stage so I went over them again, changing the colour mixes slightly.I put some of the sky colour into the middle and foreground … to give the effect of sky reflections on wet sand. At this point I started to put shadow detail on to the figures in dark red, blue-green and red-brown. I kept the shadow shapes very simplified with little softening or blending of edges – See photo of detail below.I kept the paint thinned down and semi-transparent using painting medium to dilute the pigment.At all stages I kept a watchful eye on progress by checking in the mirror. In this way I was able to determine if the effect was what I wanted when viewed from a distance. The final stage involved adding more body colour and glazes to various parts of the painting until I felt satisfied with the overall effect. I reach a point where I feel that I can usefully do no more.Enough is enough, already! Thankyou Leslie for sharing this with us. It is always interesting and helpful to see how other artists handle different problems that arise when painting. I have been an admirer of your artwork for some time now so it was nice to have and ‘inside peek’. Two thumbs up for a wonderful article. What a lovely study, Lesly. I look forward to more instruction from you as I thoroughly enjoyed this one. At first I thought that it would be uninteresting as there didn’t appear to be much colour but all of a sudden the colours shouted, ‘Here we are ‘! Great subject, too. Thank you. Thanks for sharing these useful tips and wonderful demonstration. I admire your artworks and hope to see some more demonstrations. Thanks again! 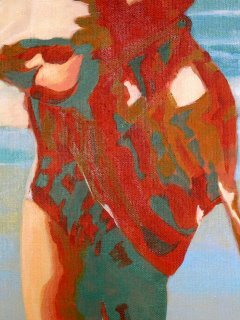 Your underpainting with red oxide gives such pizazz to this painting, I plan to try this out today in the oil sketch I’m working on…it may be just what I need. Thankyou for your demonstration. I really liked the fact that your piece was so unstaged and now I appreciate the use of acrylics much more. All of the artworks I have seen with acrylics have been struggling to have a 3D effect, but your artwork created the 3D effect wonderfully. Thank you for leaving your wonderful comments about Lesly’s work. I am happy you enjoyed this post. I am sure she would love to hear from you. Please take a moment to visit her site below and drop her a line. Thank you so much for the tips I am a self taught artist. I love working with acrylic and building up with various materials.I am working on a piece now that is somewhat frustrating to me because I didn’t really take into consideration the transparency of the pigments I was using. Your tips on the colour helped me tremendously.Thank again for the good advise. Lesly, I’ve breezed through tips and am in awe of what art is all about. I’m seventy-five years old and have the urge to paint. I have bought a starters kit, but it seems over my head as how to proceed. I have taught myself to play several sports and very well I might say and I had thought I could do the same thing about painting. I will try and if I make it I will be because of some of your tips. Having just started drawing and painting I was tempted to give up because my basic drawing was so off! The teacher said try a book called ‘Drawing on the Right Side of the Brain’. It is a book to work through and I got a copy out of the library. It seems to be working and I got a copy of my own. The writers premise is that if you can write you can draw. What she teaches is how to ‘SEE’ rather than what your brain says is there. A good example is drawing a cube – rationally it is squares – to ‘see’ a cube is some funny shapes! I would recommend beginniers to get a copy out of the library and just spend some time working through it. Once I can knowck out the basic drawing I know that when I add paint it has an outside chance of looking right! I like that effect, it reminds me a bit of what you can do with photographic techniques, both analog and digital. Love the step by step. You always have great lessons even for beginner painters. I agree with the last comment too. It looks very much like a photographic affect but i love how its hand done. When it comes to acrylic paints, i am a starter. So thanks for giving this tips that will help me gain more knowledge about acrylic painting. I like the scene, oh it is wonderful. Thank you so much for sharing with us. I learned different techniques to improve my artworks. Hope too see more demo.Thumbs up! Wow! Impressive. It seems that it was very easy for you to do it. From the scratch to the finale it was great. I am really having a hard time with acrylic painting but this will give me some hint on how do to it. Superb work. Thank you everyone for your lovely comments. I am glad that it has been of interest to you. And you are quite correct … I wanted to reproduce effects in paint similar to those that can be obtained by photographic methods. It certainly makes the image ‘pop-out’ at you! 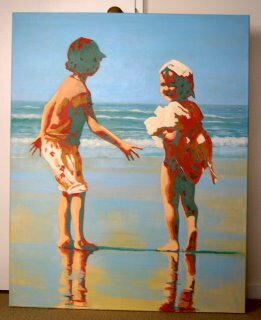 I have just posted a photo of one of the children on my blog … grand-daughter Yvie now 10 years old, … it shows her standing under this painting which now hangs in her home. I have to say this is outstanding! Your art is sooo beautiful, it really is a pleasure to look at and take see at how you create such masterful painting from scratch. Being a novice, I am still learning how to handle paints and colours…not to mention scale. I make a lot of mistakes so i found your tips for rectifying very useful indeed. Great to see how others work.